An outstanding piece, visually as well as in the stones used. This necklace is a head turner. 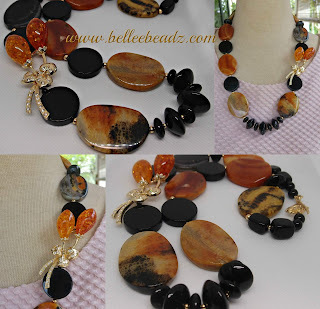 The absolutely stunning agate stones are large....4cm x 3cm and the black onyx coins are 2 cm in diameter. In the front centre are 2 cm and 1.5cm onyx wheels. For ease of wear, I've used black onyx 'pillars' around the neckline. However, the whole creation sits comfortably and is not bulky or heavy for the wearer. To complement the 'fiery' visuals on the agate stones, I've added a 'faux' Amber connector.